WASHINGTON — D.C. is making changes at the intersection where a cyclist was killed downtown earlier this month, but those who travel that area daily say more needs to be done to improve safety. A ghost bike, painted white and covered in photos and flowers, sits at a busy intersection off Dupont Circle where 36-year-old Jeffrey Hammond Long was hit while riding in the bike lane. 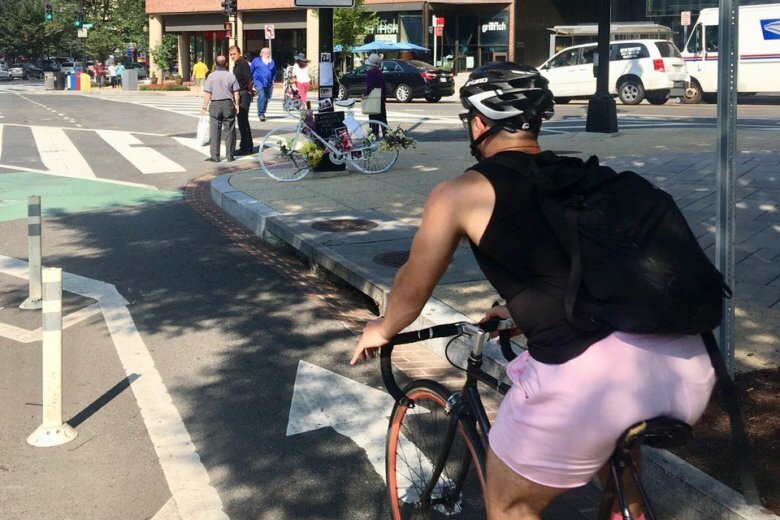 “As an experienced cyclist, biking down M street through the intersections of New Hampshire and 21st is chaotic at best on a quiet day,” said Rachel Maisler, Ward 4 representative on the D.C. Bicycle Advisory Committee. It’s particularly dangerous when cars in the center lane of M Street are forced to turn right across the bike lane to reach New Hampshire Avenue, she said. After the deadly accident, D.C.’s Department of Transportation permanently removed four parking spots nearby to increase visibility. “I commend DDOT for pulling the four parking spaces, but that’s not enough,” Maisler said. “I think there needs to be more traffic calming improvements at the intersection.” She suggested widening the curb space at the intersection to make the angle such that drivers need to slow down to turn. “DDOT should ban right turns at that intersection. If there isn’t enough political will, then there needs to be a turn arrow and a green light and as pedestrians are walking, then the cyclists are riding as well,” she said. Hammond Long is the second cyclist killed while biking in the city in as many weeks. Malik Habib, 19, was biking in the H Street corridor in June when his bicycle tire got caught in the streetcar track and he was killed by a charter bus. There is a memorial ride in the works along H Street in his honor and to raise awareness for biking safety.